Did I tell you the story about Mahler which I had from my mother? Apparently her mother, Lucile Newell Schiff, Samuele's (Carlo) third child, and second daughter, always said that when she wrote her autobiography she would tell that aged 4 she was carried up to bed on Gustav Mahler's shoulders. Maybe this was on one of the occasions when Gustav was spending Christmas with Henriette/Emma who would have been aunt to my granny: he could have gone to supper with Carlo or maybe they were staying with the ladies. I am so glad to have this other confirmation of the connection with Mahler. Almost certainly Lucile met Mahler in 1892 when he came to London as a guest conductor from 26th May to 23rd July. The dates are perfect. 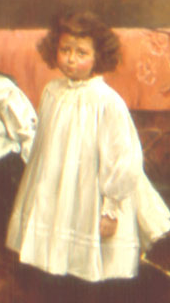 Lucile was born 27th February 1887 so she would have been five. I am sure the three Schiff sisters in Hamburg would have given the introduction. Mahler was in Hamburg from 26th March 1891 till 1897, and his friendship with the Schiff sisters was strongest at the beginning of his sojourn. There is another link. revealed in the autograph book of Rosie Schiff, daughter of Alfred Schiff. She must obviously have been on another visit to her three aunts in Hamburg, for her autograph book, which was sold at Sotheby's for £6,875 in 2012, has Mahler's signature with the inscription: 'Auf Wiedersehen in London! ', Hamburg, 24th March 1892. He left Hamburg on 26th May 1892, in order to travel by ship to London. Perhaps it was Rosie, as much as her aunts, who, having met Mahler at their house in Hamburg, arranged to meet him in London at the home of her uncle Charles at 22, Lowndes Square. Rose Georgette Schiff was born in 1874, and was staying with her aunts in Hamburg in August 1891, as she signed the visitors book at Toni Petersen's on July 31st 1891. When Mahler signed her autograph book she would have been almost eighteen years old. Lucile Schiff at the time of her meeting with Gustav Mahler. Painted by Julian Russell Storey in 1892.